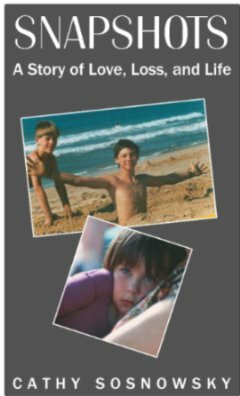 Beautifully written and skillfully architected around family photographs, Cathy Sosnowsky’s Snapshots: A Story of Love, Loss, and Life is an unforgettable personal journey through the death of two children and the loss of two others to drugs and crime. And it’s a story of love. I walked beside Cathy on each page and felt such admiration for her tenacity, her delicate understanding, and for the choices that led to some solace and hope. Her painful descriptions of the loss of her newborn daughter, Suzannah, and of the night her teenage son, Alex, died are both difficult and compelling to read. The ongoing consequences of Tanya’s and Michael’s damaged past that led them to life on the street tests the family’s commitment to be the best adoptive parents possible, to set boundaries, to love through pain and despair. For Cathy, the losses were terrible muses for her creative and ultimately healing energy. Snapshots is insightful, tender, painfully honest, poignant, and stark: a rare candid look at a family’s life. Even after I put the book down, this story stayed with me. I consider it a privilege to have read this book and to know this extraordinary woman. Those of us who have also lost children can find hope in reading about Cathy’s journey, can find compassion, comfort and even gratitude. We learn that love is forever no matter where our children may be. Choosing life and love is the testament of hope over loss and grief. In the end, Cathy chooses to look to the future with her husband, Woldy, and beloved granddaughter, Ainsley, and she looks with hope. Reading Snapshots is a healing journey – not to be missed. You can purchase Snapshots from your favourite bookstore (ISBN f978-1-894694-80-3) or direct from the author at csosnowsky@shaw.ca. Most parents can’t imagine what it would be like to lose one of their children – the grief and pain would be unthinkable. Cathy Sosnowsky not only experienced the loss of her son, Alex, at the young age of 17, but also her two adopted children, Michael and Tanya. However, these two younger children weren’t to a freak accident, but to the allure of drugs, alcohol and the mean streets. Find out how Cathy deals with her pain and suffering through her poignant and, sometimes humorous, memoir; Snapshots A Story of Love, Loss, and Life. This book takes the reader on a mother’s journey. Cathy’s love for her children is strong and will break your heart as she holds nothing back in telling her tale – to take in two older children in need of love and a home is to be commended – only to have these children shun her and turn to the drug addled streets. I have personally never felt the lose of a child, but my heart goes out to Cathy in her struggle to make sense of the life she was given. Snapshots is truly a book to be read, especially if you’re dealing with the loss of a child.